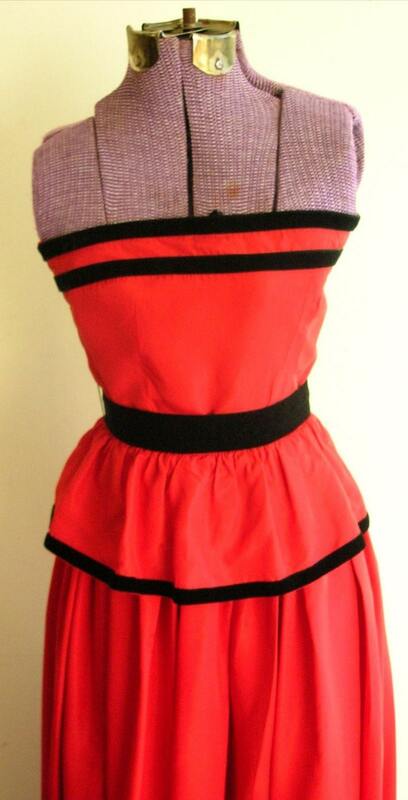 1940's Red taffeta full length gown. Label reads " Nora Zandre " . The strapless top of this gown is straight across the chest, and is trimmed with two rows of 1/2" black velvet. The waist is tight and is encircled with 1 1/2" long black velvet ribbon. Long side zipper is extended from under arm to hip. 5" peplum is gathered front and back beneath waist, edged with two rows of 1/2" black velvet edging. Long skirt of dress is gathered under peplum, with two more rows of black velvet edging at hem of skirt.